DZIEŃ ŚWIĘTEGO MARCINA W POZNANIU! Saint Martin’s Day in Poznan! Saint Martin’s day and the National Independence Party coincide each year on 11 November, becoming a day long awaited by Polish people and other citizens, to celebrate and have a rest of the work! 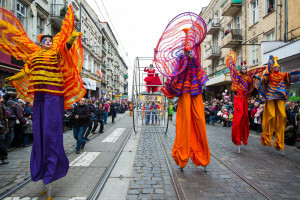 In Poznan, the celebration is lived intensely with concerts, fairs, exhibitions and theatrical performances that take place on the main street “Św. 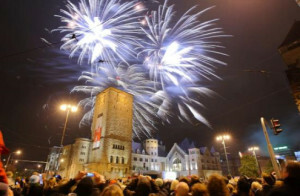 Marcin” throughout the day till the end, with the expected fireworks in front of the Center of Culture “ZAMEK”. If you are in Poznan this day, be sure that you will enjoy them, because it is worth seeing… They aren’t normal fireworks, they are synchronized with the music and hurled very close to the people, simply exciting. It will be a crime if you don’t meet this day the tradition of eating the famous croissant (In polish: ROGALE ŚWIĘTOMARCIŃSKIE) accompanied if possible, with a hot wine or coffee! But make sure that they have the appreciated certificate! 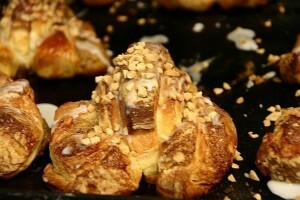 If any candy store want to use the name ”The Swiss St. Martin”, must apply for a special certificate in the Board of the Swiss St. Martίn (created by the Board of Poznań and the Board of confectioners and bakers in Poznań) It makes every effort to get permission, considering that the amount of croissants that residents and visitors eat this day revolves around 300 tonnes. What is the story? One year, the pastor of the Saint Martίn’s church commands the faithful to do something good for their neighbors following the example of St. Martin. A certain owner of one Candy Store decided to share their croissants with people. Mr. Melzer sold them to rich people and gave them away free to the poor.